Five years ago, sparked by community request, Evanston Swims! began as a pilot effort to provide life-saving water-safety and swimming skills to Evanston children. 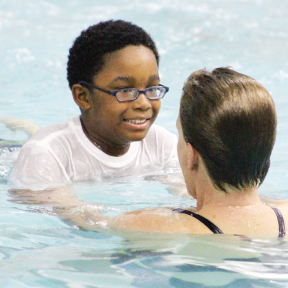 About 100 second graders from three Evanston schools visited the McGaw YMCA and the YWCA Evanston/North Shore monthly for swim lessons and classroom discussions. That small pilot has blossomed into a fully-established program, serving more than 1,000 children from eight schools and involving numerous organizations and dozens of volunteers. This year, thanks to support from the Evanston Community Foundation, Evanston Swims! will have its own coordinator. “Evanston Swims! has become an important community-wide effort, and having a coordinator will significantly enhance communication, raise awareness, and support financial sustainability,” said McGaw YMCA Associate Branch Executive Director Lori Siegel. – Volunteers from a variety of groups, including youth from the Justin Wynn Leadership Academy, dedicate their time to Evanston Swims!. The program developed out of Evanston150, an initiative to celebrate the city’s 150th anniversary in 2013 by soliciting suggestions from residents about ways to enhance Evanston. At the time, roughly one-quarter of Evanston children had no swimming experience – a vital life skill for all children, especially those living in a lakefront community. Siegel said volunteers are always needed, particularly group leaders who can help children transition smoothly from school to pool. For more information or to volunteer, please contact Evanston Swims! Coordinator Mary Miller at evanstonswims@gmail.com.